Located in one of the most historic buildings in one of the most historic cities in the Netherlands the exhibition of Roger Hiorns and Joseph Beuys stretches its poles between a romantic past, a visceral present, and a tenuous future. Roger Hiorns introduces the atmosphere immediately by staging performances (15 minutes starting every clock hour) involving nubile boys delicately pitched on (extra)ordinary found objects. 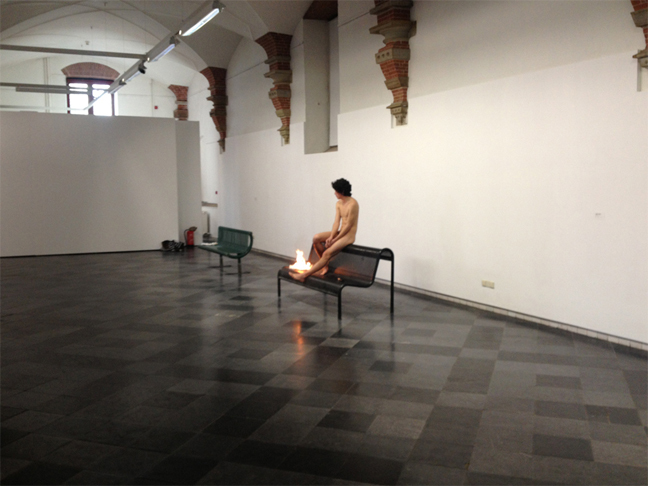 The living sculpture is accompanied by a slowly burning gentle fire, of which the model seems to be casually observing. The effect is both galvanizing and uneventful; as the viewer studies the curves and clefts of the performers body the flames slowly dwindle, opening the exhibition hall into an esoteric time capsule. Behemoth engines are suspended and arranged in such a way that demonstrates a delicate and almost surgical removal, each outfitted with padding and burnable mediums that are to be used in future performative acts. Hiorns rationale is to “activate” the otherwise dead objects by means of flesh and fire, a strategy that serves to awaken a sense of fascination… an intrigue that is fostered in the following floors of the exhibition.The second floor of De Hallen is entirely reserved for two installations by the contemporary art heavyweight Joseph Beuys. As suggested previously, Hiorns by no means trembles in Beuys shadow, rather comes off as an adolescent conceptual offspring. The two works showcased by Bueys play on the artist’s subtlety, and demonstrate (dare I say) elegance in design sense. “Voglie vedere I miei montagne (1971)” could potentially be a storefront showcase. 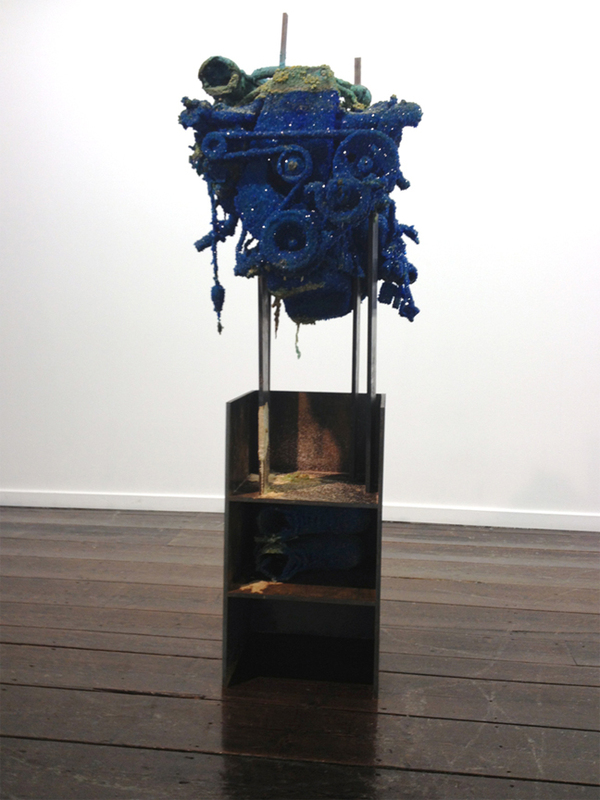 The third level returns to Roger Hiorns, an entire unbroken surface dedicated to the young artist alone. Viewers first encouraged to immerse one of their hands into a -20 deep freeze in preparation for experiencing walls of small white paintings lacquered in bovine liquids. 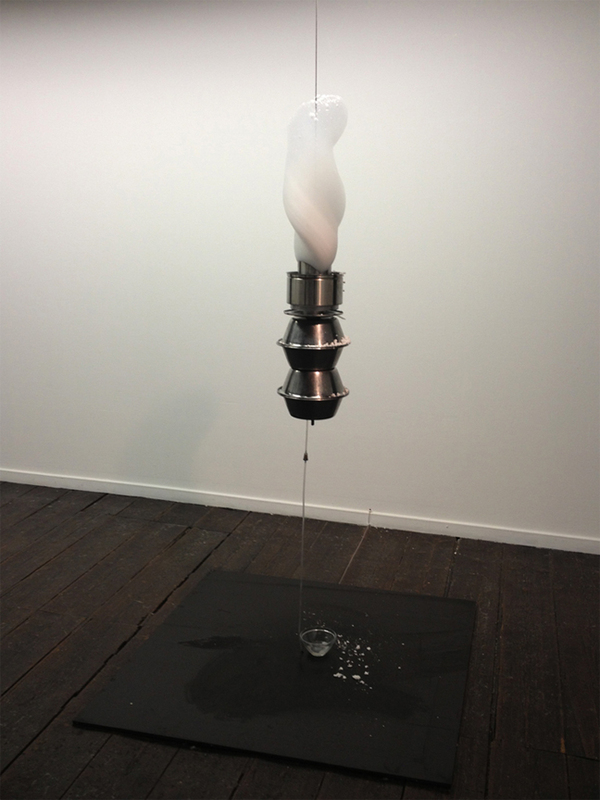 The process itself comes off as somewhat gadget-based and esperate, especially considering the utter simplicity of summoning the sublime in his previous performative endeavor. Viewers proceed into the next area, a phenomenological playground complete with a ceiling mounted apparatus that sporadically spits out coins. Highlights of the exhibition are the “Untitled” Car Motors, which are entirely encrusted in copper sulfide crystals a la pave set Rolex watches. Hiorns literally shines, and one can see he is truly in his element when he is in play with the naturally occurring and the iron-willingness of all that is human. Conceptual hoakyness is subjugated by a manic attention to detail, and a prophetic attention to pure form. 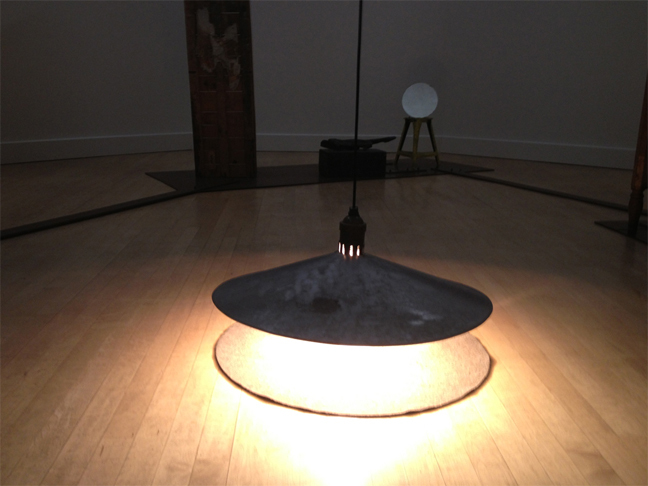 In this context Hiorns and Beuys certainly hold a conversation. A conversation about the magnificence of Sculpture with a capital S, where the viewer is uncertain what is going on, and abandons mora(l)(t)ality to a greater force, be it manufactured or primal.